You are here: Australian Herbicide Resistance Initiative › News › Pre-emergent herbicides in stubble – strike or foul? Ever tried walking out onto a 10-pin bowling alley? It’s generally not pretty, often resulting in a rapid and undignified descent to ground level…But that’s just what we need to get pre-emergent herbicides to slide off stubble and into the soil, which can be difficult in higher residue systems. Rainfall is obviously a key driver in leaching herbicides from stubble before they dissipate, but as we all know rain can be an unpredictable beast. Fortunately, research has shown that some pre-emergent herbicides require far less rainfall to move off stubble and into the soil where they can control germinating weeds. So, what happens when there’s no rainfall? Research has also shown that some herbicides can remain on stubble for long periods and still be active when rain occurs up to two weeks post-application (two weeks was the longest period tested). This is a pretty valuable attribute for dry sowing – as understandably growers can be reluctant to spend money on premium pre-emergent herbicides if there’s no rain in sight! This latest research by Dr Yaseen Khalil from AHRI compared the effect of rainfall on leaching of Sakura (pyroxasulfone), Arcade/Countdown (prosulfocarb) and trifluralin applied to wheat stubble. In a nutshell, Sakura was the best option in heavy stubble loads, leaching into the soil with just 5 mm rain, even where rainfall was delayed up to 14 days after application. Arcade/Countdown generally required more rainfall to leach into the soil, and only with rainfall up to seven days after application. There appeared to be little trifluralin leached from stubble, even with rainfall one day after application. A ‘strike’ for pyroxasulfone! (Cue cheesy bowling alley music…). This research is good news for the increasing number of growers who are dry sowing in stubble retained systems. They’re often faced with difficult decisions regarding the use of pre-emergent herbicides in dry conditions, particularly as weed pressure can be high following germinating rainfall. Yaseen’s research has shown that just 5mm rain can leach significant quantities of Sakura from a 4t/ha stubble. Even more importantly from a dry sowing perspective, Sakura remained active on the stubble for up to 14 days without rain (it may last longer but this was the limit of the trial treatment). Even then, it was able to be washed into the soil with just 5mm rain. Fig 1. Sakura leached easily from stubble and remained active without rain for up to 14 days. Arcade/Countdown generally needed more rainfall than pyroxasulfone to leach from stubble into the soil. Without rain, prosulfocarb was able to remain active on stubble for up to seven days before it started to dissipate, although there was still some activity up to 14 days. Fig 2. 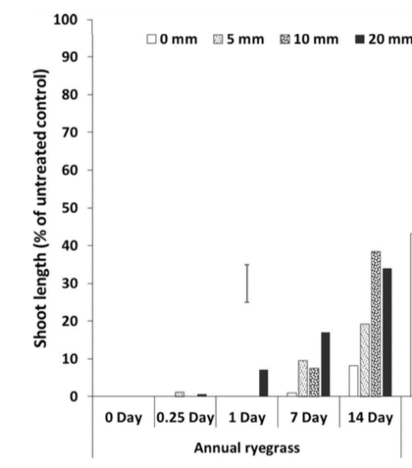 Without rain, prosulfocarb remained active on stubble for up to seven days. 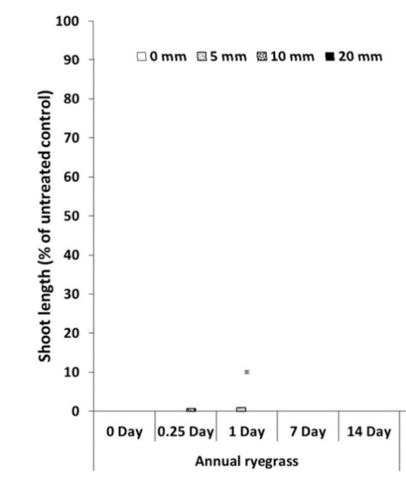 Under the 4t/ha stubble load used in the trial, rainfall had little impact on leaching trifluralin into the soil more than one day after application and appears to have fully degraded/lost from the stubble within 14 days. Previous research (Grass et al, Bedos et al) has shown that up to 96% of trifluralin volatilises within 48 hours of application. Fig 3. Rainfall had little impact on leaching trifluralin from the stubble more than 1-day after application. Higher rainfall generally caused better leaching of herbicide, particularly if it occurred soon after application. 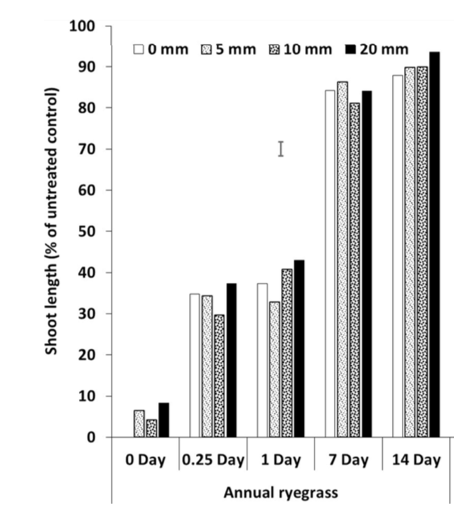 Although rainfall intensity had no significant effect, a single rainfall event of 20mm leached slightly more herbicide from stubble than four 5 mm events over two days. If only we could control it! 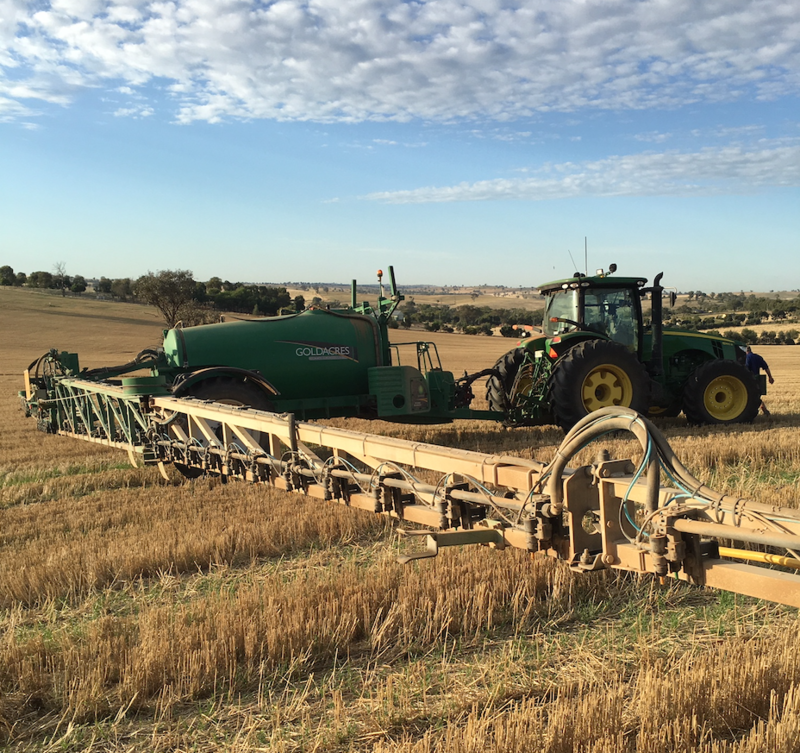 Stubble retained seeding systems offer many advantages to crop growth but the efficacy of pre-emergent herbicides is often cited as a negative. 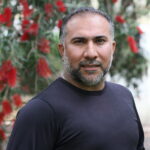 Yaseen’s research highlights that not all herbicides behave the same in stubble, and some can perform effectively with limited rainfall – select the right one and you may just bowl a strike.